WAPCOS Limited is going to recruit fresher candidates in India for Office Manager, Support Engineer Posts. So, those candidates who are willing to work with this organization they May apply for this post. Last Date of Apply 23-January-2018. Total numbers of vacancies are 16 Posts. Only those candidates are eligible who have passed Diploma in DCA/PGDCA with working knowledge in MS office, excel, power point etc & Degree in (relevant branch) Engineering with 5 years’ experience OR Diploma in (relevant branch) Engineering. 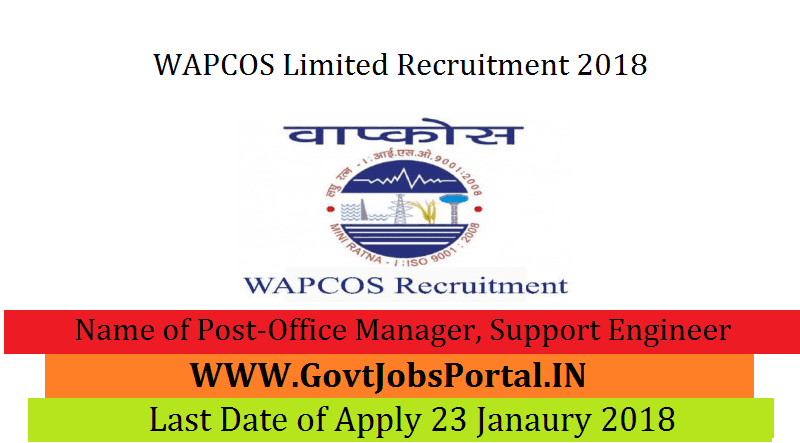 Indian citizen having age in between 18 to 45 years can apply for this WAPCOS Limited Recruitment 2018. Educational Criteria: Only those candidates are eligible who have passed Diploma in DCA/PGDCA with working knowledge in MS office, excel, power point etc & Degree in (relevant branch) Engineering with 5 years’ experience OR Diploma in (relevant branch) Engineering.